The rise of artificial intelligence (AI) within the business world has created many changes in how certain aspects of business are performed and nowhere is that more apparent than in mobile marketing. AI offers the opportunity for a marketing plan to be actively data-driven rather than reactive, and in the mobile world where real-time responses matter the inclusion of AI allows instant analysis for historical and current behaviors to instantly provide the best user experience. Today the New York Digital Marketing Firm, Lounge Lizard, discusses 4 Ways AI has Revolutionized Mobile Marketing. Voice search recognition – The rise of voice assistants, both in mobile devices such as Siri and in-home devices like Alexa, has revolutionized how many people interact with technology including apps and media. AI allows a business to actively learn from each interaction, including word usage and phrase nuances along with the general data requested, music or movies being enjoyed, etc. Spotify and other music providers allow for voice search on their apps which can then improve the customer interactions. Optimized content delivery – Consumers are typically overwhelmed with data. The options for obtaining information has increased each year and because of this data-overload the average attention span has steadily decreased. That makes optimizing content delivery more important than ever to not only put content in front of customers at the right time but also grab their attention within just a few seconds. AI can analyze behavior trends, usage patterns, and preferences to provide valuable insights on the proper timing depending on the demographic and channel to send push notifications, post to social media, send an email, or release a newsletter. Intelligent targeting of ads – Facebook and Google already use AI within their ad programs because it allows for a more intelligent targeting of ads to consumers. Of course, occasionally there will be a complete miss, but for the most part the targeting is very effective at predicting behavior based on the data available. AI is useful in better understanding of an audience and predicted behavior, defining the ad objective, reaching the audience, and providing on demand delivery. Amazon uses sophisticated AI for their related products. Spotify uses AI for music recommendations. This allows delivery of relevant, more personalized suggestions that are more likely to convert in milliseconds without the need for human supervision or interaction, which would just slow the process and its’ effectiveness down. Content creation – Somewhat surprisingly AI can be useful in content creation. The creative process isn’t always seamless and sometimes ideas for content are not pouring out of the human brain as often as original content is needed for marketing. AI provides shortcuts to the process by adding algorithms which can analyze considerable amounts of data to better define parameters for compelling content. 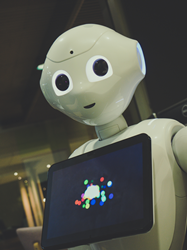 Finding popular topics without substantial amounts of content already created, optimizing email subject lines, and personalizing push notification titles are just a few ways AI is being used to improve the content creation process with the click of a button. Lounge Lizard New York Web Development Company is an award-winning, high-end design boutique specializing in website and mobile app development, UX/UI, branding, and marketing. Lounge Lizard excels in creating the ultimate brand strategy, fully loaded with expertly crafted visuals that work together to increase sales and effectively communicate a client’s unique personality.